In late December, the Express Bus Advocacy Group met with Assemblyman Dinowitz to discuss the feasibility of an HOV lane on the Major Deegan Expressway. During our meeting, we also mentioned our ongoing talks with the Comptroller's Office to petition for another audit of express bus service Citywide to force the to get their act together. Since the 2015 audit, very little has changed regarding express bus service, and in fact service had deteriorated significantly since then, and the Staten Island redesign continues to be a failure, with hundreds of commuters complaining on social media and at the bus stops about constant late and missing buses and overcrowding. The same is true of the other boroughs where there has been no redesign. This afternoon we received word from Assemblyman Dinowitz's office of his interest in seeing another audit done as well. The letter is below, along with the correspondence written to the DOT for a possible HOV lane on the Major Deegan Expressway. There's still a lot to do. We have other news as well that I'll be posting. On the HOV, is it just restriping the #1 lane, or is it widening the Deegan for an extra lane that's separated from the other three? No idea. We talked about it in Dinowitz's office. The main obstacle he mentioned was the narrowing of some areas of the Deegan and how an HOV lane could create a problem from that perspective if say emergency vehicles needed to get through. My response to that was that if an HOV lane couldn't be implemented, then we need to look at other traffic mitigation measures, so we discussed the possibility of physical barriers along parts of the Deegan, particularly where the Deegan and Cross Bronx meet located, and another area leading to the George Washington Bridge. Those two areas cause considerable backup. The DOT ideally has to look at the feasibility first. 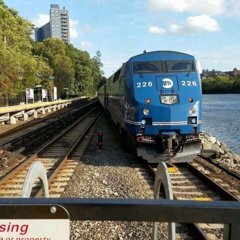 I personally wrote to Cuomo years ago when work on the Deegan started requesting an HOV lane because my thinking was if he's allocating tons of money to rehabilitate the expressway, this is the perfect time to address congestion issues there. His office wrote back and said that a traffic study had been undertaken and that there was no need for an HOV lane at the time, which is total BS. Often times the Deegan is a parking lot. "We should be aiming for perfect service...."
No politician ever truly wants that, because complaining about problems is always better than solving them. After a problem is solved, it's no longer there to complain about or campaign about or fund-raise about. Besides, how many more audits is the MTA supposed to keep paying for? A full "forensic audit" of the entire MTA will show millions of dollars being spent annually on audits. I see that reading is fundamental. He didn’t say that service will be perfect. He said we should be AIMING for perfect service. Big difference. The currently has NO goals set for express bus service with regards to on-time performance, yet they proudly BOAST about their on-time performance for Metro-North, which is OVER 90%, yet express bus service, which according to them is a “premium service” as they noted in my first meeting with them doesn’t get the same treatment because they don’t control traffic. Well they also don’t control the weather which affects rail service, but they don’t use that as a convenient excuse as to why they can’t do anything. Additionally, the audit would be performed by the Comptroller’s Office, just as the first one was in 2015. The MTA has to pay for all of its audits, even when they're done by state agencies (which is most of them). Exactly! We’ve been tracking the QM1 for months now, and I told you before that the 4:00pm and the 4:30pm usually did a second trip (6:30pm and 7pm respectively). Well looking back at what we logged, they routinely don’t fill two to three PM trips. There’s only seven trips and they run every 30 minutes, so that means you have a gap of an hour numerous times during rush hour. Just incredible. We’ve even stood at 42nd and 6th to see if any buses were indeed coming but just not on BusTime. Nope... Same deal... We logged every bus that came from 4pm to 7pm one day. The morning QM1 trips are fine because they don't do second trips (none of them), so they usually are there sitting at the stop ready to go. On occasion there have been some ghost buses since they use some of the old buses here and there, but most trips are filled. I have people that can confirm this as I track the buses, as one of the guys that helps me with the Advocacy Group is a long time express bus rider from Queens, so he's in the City early in the morning and often times can see if express buses have come or not or he drives to an express bus line and fills me in on things like crowding, etc. The PM trips become interesting. Given that they've been missing trips for so many weeks, even now after this latest pick, I decided to look into all seven PM trips to see just what exactly they do. As I noted, the 4pm and 4:30pm trips do a second trip - that is easy to figure out just by tracking service every day. For whatever reason since this pick, I have not seen the 6:30pm and 7:00pm trips consistently filled despite them coming at 4pm and 4:30pm on-time. Supposedly both of them do a trip to Fresh Meadows, then deadhead back to the City to do their last trip on the QM1, but the 4:30pm rarely gets back on-time. Aside from that, the 4:30pm is supposed to shuttle other express bus drivers, and then make their way to 36th and 6th, so that trip is much more likely to arrive late or not at all, not including deadheading back to the City. The last time I met with the , I was on their @ss about the run times in Queens. I wanted to know why the run times were such a mess. The guy doing the scheduling could only shrug his shoulders, so I told them this time, I want someone there from Bus that specifically oversees the QM scheduling because this mess has to be fixed. The weekends are by far the worst. Every trip that we take or track on the QM5 or QM6 is habitually late to Queens, anywhere from 20 - 40 minutes because they don't give them enough run time between 57th & 3rd and Main St and Union Turnpike. The shuttling thing is interesting--I've seen that on occasion on off-peak buses, but nothing consistent. Problem is if they hit traffic coming over from Quill, that QM1 trip will be late or won't be sent out. Sounds like typical MTA logic..the service itself is the lowest priority. I'm willing to bet that if they need to pull drivers they'll take them from the QM1, so for example, the QM3 surely must take priority because there's only three trips in each direction to and from Little Neck. I'm going to ask for a more in-depth explanation because I specifically requested all trips to be filled in my express bus network review. They have met that request in the morning because I believe there were morning trips missing as well. Sometimes there are legitimate problems that causes a mess. For example, the other night there were standees on the X28 and people were pissed. I was told the reason was due to the funeral for that firefighter. Some drivers had to do trips on the B3 earlier and they got caught up, so they started their X28 trips late. Between that and the ongoing lack of buses fiasco at some depots, it's a mess. Drivers who miss their runs still get their full run pay.